Twenty years after a deadly pandemic ravaged the world, Darragh Fearghal Anluan and the people of his village have carved out a hard but simple life in the Irish countryside. But with winter comes sickness, and Darragh must travel to Dublin in search of medicine. What he finds there is a ruined city ruled by a madman, where scavenging is punishable by death . . . or conscription. Ciaran Daly came to Ireland with aid and optimism, but instead was enslaved by the so-called King of Dublin. After months of abuse from the king and his men, he has no reason to believe this newcomer will be any different. Except Ciaran finds himself increasingly drawn to Darragh, whose brutish looks mask how sweet and gentle he really is. The tenderness Darragh feels for the king’s treasured pet is treason, but it’s hardly the only betrayal brewing in this rotten kingdom. Rebellions and rival gangs threaten the king’s power, but not nearly as much as Darragh and Ciaran—whose only hope for freedom is the fall of the king. 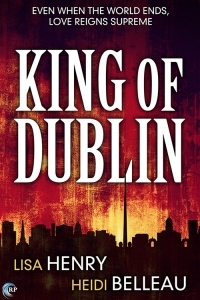 Please note King of Dublin is currently out of print. Darragh twisted around, his heart thumping. How long since he’d heard another voice? Days. How long since it had been a stranger’s? Darragh couldn’t remember the last time he’d heard someone speak and not instantly known who it was. For a moment, Darragh was overwhelmed. There was something almost magical about the act of meeting a person for the very first time, something mythical—stories remembered from long ago about places and faces he had to draw from his imagination, stories of wanderers and strangers and mysterious crones—and then his gaze took in the hostile look on the man’s narrow, pinched face and the baton he had clutched in his hands. One stranger turned into five as men melted into the doorway behind the first. Darragh squinted against the light in their direction. “What’s your business here?” the first man asked him. The men exchanged glances; one laughed. “This is no hospital anymore,” the first man said. Darragh had known that the moment he’d found the place. An old map and his memories had brought him here, but neither was of any use now. He remembered white halls and fluorescent lights. He remembered curtains with zoo animals on them and a bed that went up and down if Aiden let him press the buttons. He remembered nurses with uniforms the color of soft pastels, who smelled of antiseptic and gave him sweets. He remembered the hospital was where you went if you were sick, where they gave you medicine. He remembered the hospital had been Aiden’s best chance, even if the doctors had described that chance in odds that Darragh hadn’t understood. Fifty-fifty became thirty-seventy, became nothing. Darragh had come looking for that best chance again, but the city was a ruin, and so was the hospital. Its corridors were filthy. Most of the windows had been smashed out. There had been a fire at one time; Darragh had picked his way through the charred skeleton of a wing before he’d found a section of rooms that were more or less intact. If there had been anything to scavenge, it was long gone. Now the strangers had him cornered in the place. “I need medicine,” he told them. He carried a knife in his pack but couldn’t risk reaching for it. He didn’t know these men and couldn’t judge their intentions. They were hostile, wary, but were they murderous? He couldn’t tell from looking, but the fact that three of them carried guns didn’t fill him with confidence. Maeve had begged him not to go to Dublin, but another winter like the last one could be the end of them. He couldn’t risk that. Bad enough he’d had to bury six. She’d warned him that it would be dangerous, but that was only speculation. She couldn’t know any more than Darragh did what things were like outside the valley. If this moment proved her right, it was only by chance. Every ruined town Darragh had passed on the way—waiting until night to slip through if it was too large to go around—should have warned him to turn back, but he’d needed to see with his own eyes. Wouldn’t let anything except experience crush his hopes. Somehow he’d convinced himself that the things he’d seen on the way didn’t count, that the destruction and the decay weren’t proof that Dublin would be the same. He’d even managed to talk himself into the opposite. The more ruin he saw, the more Dublin had to have withstood it. In his memory, Dublin was untouchable. It was shops and movies and trams and more cars than he had ever seen, and at the centre of it all was the hospital, standing like a fortress in his mind. Unbreachable. “I need medicine,” he said again. “What?” One of the men leered. “I need medicine.” Was it his accent that was difficult, or were the words wrong? He was slow with English. “You come with us,” the man said. The king’s men formed a circle around Darragh as they walked him through the trash-strewn corridors of the former hospital. Glass crunched under their boots. Darragh assumed they must patrol this place often, because they didn’t walk with half the caution he had; they moved decisively, and every turn they made led them along safe paths. Even though he was sure he’d never be returning, Darragh still memorized their route. Committing things to memory was a skill and a habit essential to survival now. The ruins of the hospital were overlaid in his mind with images from his childhood, the pieces not quite fitting. Old and new not reconciling easily. But then, Darragh was used to that. His memories of his father farming included massive machines, loud rumbling, the smell of petrol fumes, but Darragh did the work by hand with the same tools his father had left disused in an old outbuilding, and now it was his father’s machines that were left to rust. Everything his father had taught him before, all useless. Darragh had no teacher but trial and error. The people of his village had failed more often than not in those early days. Gone hungry, gone cold. Weren’t that much better off now, but at least a couple of Darragh’s crops had survived the wet summer, providing them with stores for winter. But it wouldn’t matter if the winter illnesses took them instead of the hunger. This king, though, whoever he was—the men escorting Darragh said he had medicine. Darragh hadn’t heard of a king in Ireland, but if the man had medicine, then Darragh would call him emperor president, if that was what it took. He walked with the men out into the late-afternoon light. Darragh couldn’t remember the last time he’d been in a vehicle. His father’s tractor, maybe. It had rumbled underneath him, bouncing him along the ground as his father laughed and held on to him. Better than a fairground ride. Sometimes his father had hooked the trailer on the back and driven around and around the farm, and all the kids would turn up for a go. The tractor was still in the north field now, where it had run out of petrol years ago. Jesus. The king had medicine and guns and petrol? Maybe he really was a king. Just because Darragh couldn’t remember one didn’t mean anything. He’d been a kid when it happened, when everything went to hell. He hadn’t known much about the world then, and he knew even less now. The king’s men bundled him into the back of the truck, and all but one of them joined him there. The last man stayed out, slamming the door shut between them. A clunking sound came after, which Darragh assumed to be the lock. Trapped. He took a deep breath. Even though the men had been aggressive with their guns and truncheons, they hadn’t given him any real reason to think they planned to do him harm. If they were wary of strangers, Darragh didn’t doubt they had good reason. “Don’t have to lock you up, do we, culchie?” one man asked, and brandished a pair of handcuffs in illustration. “You do not,” Darragh replied with a shake of his head. The engine roared to life, and Darragh couldn’t stop the small gasp of astonishment that escaped him. As though they’d been waiting for it, the men laughed. Darragh put his hands on the metal bench seat to feel the vibrations as the truck began to move. The roads on his way into Dublin had been in bad condition: surfaces breaking apart and potholes the size of craters. Here, the road was still rough and the van lurched several times around obstacles. Darragh had seen plenty of rusted or burned-out cars blocking roads. Swerving around them now, he wondered if their placement was intentional. Barricades, maybe, because who knew what had happened here in those first awful days and weeks? Or maybe they were just like his father’s tractor: left to rust where they’d finally stopped. Wherever they were now, whatever the streets here looked like, wherever they were going, Darragh didn’t know. There were no windows in the back of the van, and as hard as he tried to memorize the shifts and turns as they rode, he knew he was hopelessly lost. The map in his pack would be useless if he couldn’t pick out any landmarks, and who knew if any would be left. Maybe after he got medicine, the king could give him directions back out of the city. Or maybe not. The future was an uncertain thing. Someone opened the door to the van, and Darragh climbed out. The afternoon was melting into dusk; the remaining light cast long shadows. They had stopped in front of a massive building, far enough away from it that Darragh could see the grey statues on top of the roof. A seated woman, an arm extended, flanked by two others. He wondered if they were angels or saints, or something else entirely. Below them, wide, grey columns extended from the roof to the ground. The building really was fit for a king; it belonged to another time altogether. It wasn’t until the men were escorting him up the shallow steps that he realized the building was not unscathed. There were scorch marks on the facade, and several of the columns were pockmarked with holes that might have come from a spray of bullets. He wondered again what had happened in the city in those early days of panic and terror. Living out in the countryside, he’d at least been spared that particular violence. He didn’t know if it was better or worse that way. He could remember the adults watching television, before the broadcasts stopped. Then radios, and then silence. The end of the world had come quietly to Cúil Aodha. The men escorted him through the wide doorway, and Darragh blinked in the sudden gloom. The foyer was grand and decrepit at once, a memorial to its own decay. Above them, a grimy chandelier still hung, but didn’t shine. High ceilings spoke of emptiness, not space. Their boots echoed across the dirty floor. Rubbish was strewn in the corners. Darragh gripped the straps instinctively, then thought better of it. The pack was valuable, sure, but worth his life? He shrugged it off, and handed it over. Darragh shook his head but submitted to the man’s rough handling as he checked. The room was massive. A place for giants. It dwarfed even him, and he was taller than anyone else here. It especially dwarfed the small, rodent-like man who stood in the dome-ceiling alcove at the room’s end, past the lit fireplaces with their soot-stained tapestries and a pair of huge columns. Darragh walked the length of the dirty carpet with the king’s men on either side of him, skirting the large table that took up much of the floor space. “Found him in the hospital,” another added. The rounded end of the room was actually a raised dais of black and white marble, two steps above the ratty carpet where Darragh and the king’s men stood. The king himself lounged on a filthy red cushion in the dais’s centre, a position that called for someone to be fanning him or feeding him grapes. He was a small, sharp-faced man with a wicked, childish smile and black, glittering eyes, wearing a massive golden collar like a pharaoh’s and holding a silver sceptre. “And what were you hoping to steal from your king?” the king asked, the question arching as if he’d rehearsed it. “You didn’t know what?” the king asked. Darragh opened his mouth to argue that no one in Cúil Aodha had ever heard of him, king or no, and then it occurred to Darragh that maybe he didn’t want this man to know the name of his home. Not to mention he seemed the sort who wouldn’t take such a statement with good grace. “I didn’t know,” he said again. Darragh nodded. What other ways were there? He remembered with sudden clarity a children’s picture book his mother used to read him, each page glossy and colorful. Buses and planes and cars and ships and barges and bicycles. Darragh hadn’t had any of those, and he couldn’t risk taking a horse, not when the others depended on the beasts to do the farming and heavy lifting. He had perfectly good legs. Darragh didn’t know what to say to that. He didn’t think it was true, but he’d be as dumb as the king thought he was if he said it aloud. He hadn’t met anyone on the road, not bandits and not the king’s men. But he’d also kept off the road whenever he could. After all, he may not know much, but he knew that the garda had gone from Ireland, and without them, surely the criminals would have the run of the place. Perhaps the king was a criminal himself. A king of criminals. “Medicine,” Darragh said. A king, a criminal, or both. What did it matter if the man had medicine? “Are you sick?” the king asked, a spark of fear appearing in his dark eyes. The pandemic had ravaged Dublin. He wasn’t sure if the sickness had come after everything else, or had been the cause of it. But he had seen pictures on the television of hospitals overflowing, of bodies—wrapped in garbage bags or bedsheets—piled up waiting for burials that never came to pass. It had seemed so strange and distant, like a sad movie. But it had come to Cúil Aodha, too. At least there, Darragh and the other boys could bury their dead, even if there were no stones to mark their places in the churchyard or the field. The king spread his arms magnanimously. “What medicine do you need, then?” In contradiction to his body language, however, his smile was back: that teasing, cruel smile. If the king was a boy in a man’s body, then Darragh imagined him as the sort of boy who pulled the wings from flies. He wasn’t a fool. He was on a fool’s errand maybe, but he wasn’t a fool. He and some of the others had pored over the books left in the tiny village library, learning what they could when they weren’t working. Farming, first aid, carpentry, husbandry, sewing—all skills that their ancestors had known but the modern world had forgotten. Well, they remembered now. They’d taken what they could from the books, and the rest they’d learned by experience. Hard-won, sometimes deadly experience. Last year, six had died of the flu. This year, they had the knowledge to be prepared. Antivirals hadn’t done much to stay the original outbreak; there hadn’t been enough of them stockpiled, especially not in a country on the verge of economic collapse like Ireland, and even then their effectiveness had been hit or miss. By the time they’d gotten their beggars’ hands on more, it was too late. The drugs hadn’t worked consistently or on a large scale, but maybe they would work better on the newer strains of the illness, or on these hardier survivors. Maybe, maybe not. Darragh had to try, even if it only saved one person. He couldn’t do nothing. Not again. A frisson of fear chased up Darragh’s spine. “I will,” Darragh said. There was no other answer he could give. Darragh stiffened, fists clenching at the word. Knife. But no, the king wanted his aid, and he’d agreed. No reason to kill him now. He twisted his head as movement drew his gaze. A shadow in one of the dark, oak alcoves set into the king’s wall had solidified into the childlike shape of a young man. He must have been there the whole time, waiting to be summoned for whatever the hell this was. He was lean, but pampered looking, shirtless and glittering with gold. Gold armbands around his small biceps, gold cuffs around his wrists, a gold torque at the hollow of his throat. None of it, though, quite compared to the gold of his hair. Even inside this grim, shadowed room, it seemed to gleam. In the sunlight, Darragh thought, it would burn. The boy approached the king silently, balancing a knife in his raised, uplifted palms. He knelt at the king’s side with it. The king’s pet? A lover? Well, Darragh supposed, a king could do what he liked. And who he liked. It wasn’t any of Darragh’s concern. Darragh glanced anxiously at the king’s men, but their shuttered faces didn’t give him any comfort. He raised his fingers to the mismatched buttons on his shirt and fumbled with them for a while. Then he shrugged the shirt off, screwed his courage, and went down onto his knees. Darragh grimaced. They kept saying that, but it wasn’t like he was a freak. His father had been this size, and so had most of his uncles. On both sides. He had the body of a man shaped by hard work. Maybe they just bred them small and rat-like in Dublin. That was another thing he’d probably be better off not saying aloud. “Darragh Fearghal Anluan, of Cork. I swear loyalty to the king of Dublin,” Darragh recited, held in a trance by the glint of the knife as it twisted and caught the firelight. He hissed as the blade made contact with his skin, and one of the king’s men grabbed his shoulders to hold him still. Darragh was bleeding before he even realized the blade had cut him. The pain was sudden, sharp, and then it was over; the blade had sliced a thin, shallow path down his chest, no more than a handsbreadth long, above his heart. The man holding his shoulders released him, and Darragh pressed his hand to the wound, staring wide-eyed at the king. “Thank you,” Darragh said, because the king looked like he was waiting for a response. He climbed slowly to his feet again, holding his shirt in his right hand. His left was slick with blood. He’d have to wait for the bleeding to stop before putting his shirt on again; it was one of only three that he owned, and he wasn’t so sure washing it in the Liffey would work out well for him. Maybe the king, a man with such luxuries as petrol, palaces, and a boy swimming in gold, would have a laundry tub and soap as well. But now, in the middle of this weird, unasked-for ceremony, probably wasn’t the time to ask. He figured his status as a dumb culchie would only grant him so much leeway with the king’s strange temper. One of the men clapped him on the back. The king curled his hand into a fist in Boy’s hair and tugged gently. Darragh watched as Boy turned, wetting his lips with his tongue, and bent towards the king’s lap. Boy lifted his hands to the king’s fly, and Darragh’s breath caught in his throat. Darragh, his face burning, turned away quickly and followed the king’s men—his fellows, now—from the room.